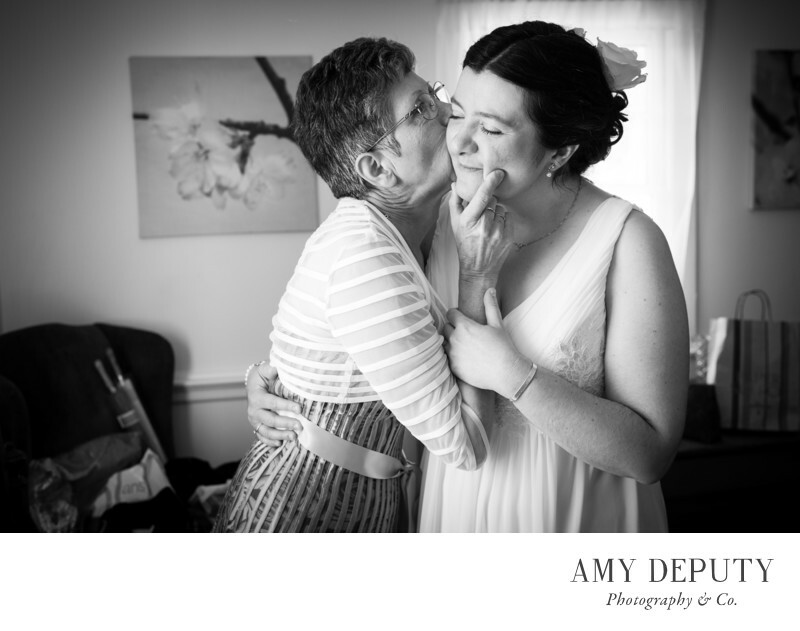 Wedding photojournalism is not just the capturing of candid moments. Wedding photojournalism is about telling a story: a story of the love of a couple for each other, the story of family and friendships, and the story of a monumentally special day. How do photojournalistic wedding photographers tell this story? By anticipating and recording gestures of pure human emotion. This little gesture of a finger on a cheek is so moving in that it shows an intimacy and closeness of a mother with her child, now grown up. This embrace is not careful. It is not a polite little hug. It’s a real deal smooch and a squeeze. By reproducing this image in black and white, the viewer’s focus is honed in on that comfortable and familiar embrace, without the distractions color may sometimes create. This moment is told and realized through its photographic portrayal of human expression, something seen and felt by subjects and viewer alike.